No Ghosting & No Degradation-Guaranteed. Interface a VGA monitor and USB device up to 15 feet. Connects VPI legacy KVM switches to PS/2 with USB port. Converts the user USB port of a VPI USB KVM Switch to a PS/2 (Keyboard and Mouse). 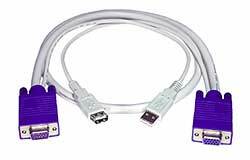 Converts the PC PS/2 port of a VPI KVM switch to a USB port (PC, MAC or SUN). Compatible with USB 1.0 and 1.1 Specification. Apple computer G4 and Xserve MAC O.S. 9/X. Connect legacy PS/2 computer to NTI USB switch. Connect USB keyboard and mouse to legacy PS/2 computer. Support for USB 1.1 Specification. Powered by the CPU it is connected to. Connect legacy SUN computer to NTI USB switch. Connect SUN USB keyboard and mouse to legacy SUN computer. Sun extra keys are emulated when using a PS/2 or MAC layout keyboard. Stereo analog output - connect headphones or powered speakers to your PC or laptop.